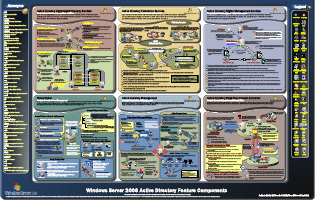 The below PDF document I got from Microsoft Downloads, helps to better understand the components of Windows Server 2008 Active Directory. The document provides a graphical representation of all the components included in the Active Directory, and it helps to better understand the additional features came with the new version of AD. How does Group policy loop back processing work? Replace Mode: The user policy is defined entirely from the GPOs associated with the machine. Any GPOs associated with the user are ignored. Merge Mode: The user policy settings applied are the combination of those included in both the machine and user GPOs. Where conflicts exist, the machine GPOs "win". A common use of loopback is on Terminal Services machines. In this scenario, it is common for the Group Policy administrator to set specific user policy settings for the server to ensure that all users using the machine receive a defined set of user policy settings. In order to define the Loopback Processing setting, the following steps should be followed. 1. Open the Group Policy Object editor (gpedit.msc). See Create/Edit GPOs for details. 2. Expand the Computer Configuration node. Under Computer Configuration, expand the Administrative Templates node. 3. Within the Administrative Templates node, expand the System node, and then the Group Policy node. 4. Locate the setting "User Group Policy loopback processing mode". Double click this setting, and define the setting as needed. · The distinguished name of the user is evaluated for it's location in the Active Directory. For example, the user John Smith in the Boston OU at BigCompany Corporation might have a distinguished name of CN=John Smith,OU=Boston,DC=BigCompany,DC=Com. · Group policy parses the Distinguished Name, and attempts to locate policies that apply to users at each "stage" of the name. The search is performed from left to right (e.g. the Boston OU is searched first, then the domain root of BigCompany). Finally, the Active Directory Site of the user is evaluated for user policies. · Based on the effective permissions of the user, Group Policy determines which of these policy objects (if any) should apply to the user. · Policies are then applied in a last in, first out (LIFO) series. So, any policies that applied at the site level are applied first, then the domain, and finally at the OU containing the user. If multiple policies were defined at the OU or domain level, the policy with the highest precedence is added to the list first (so it will be processed last, and overwrite earlier policies). · As before, Goup Policy evaluates the Distinguished Name - except this time, it is the Distinguished Name of the Computer, rather than the User. For our example, let's say that the computer is in the Headquarters OU under the BigCompany root. The Distinguished Name is OU=Headquarters,DC=BigCompany,DC=Com. · The same processing rules apply as before: Group Policy evaluates policies at each level of the Distinguished Name, adding policies to the stack of policies to apply. The difference is that Group Policy is now searching for User policies that are defined in the computer's organization structure. · This second set of policies is applied (again, Last In, First Out), with any policy setting conflicts being "won" by the last policy to apply the setting. So, if more restrictive settings are defined for users in a policy object linked to the Headquarters OU, those settings will apply to the user when logging onto a machine with Merge mode applied. Typically, Merge mode is defined on Terminal Servers in an environment. The reason for this is that Administrators typically want to enforce a specific set of desktop and security settings, to help minimize potential variables that lead to unpredictable behavior on the Terminal Server. By enabling Merge mode, and defining all potential problem policy settings, the Administrator can enforce a consistent user experience. · In Replace mode, the user's Distinguished Name is not evaluated for Group Policy processing. Instead, we rely entirely on the Distinguished Name of the machine the user is logging onto. · Again using the previous example, the Distinguished Name OU=Headquarters,DC=BigCompany,DC=Com would be evaluated for User Policies, with any policies that the user has permissions to read and apply being enforced. · As before, the list of policies to apply is built from closest to farthest away (OU=Headquarters first, then DC=BigCompany, etc..). The list is then applied in reverse order, so that the OU settings have highest precadence. · The "normal policy set" for the user is ignored completely. Part of policy application is to delete the settings applied previously, so no (managed) settings will carry over to apply when Replace is defined, unless that setting was also defined in the User Settings applied during Replace mode. Replace mode is useful for environments where specific policies are required regardless of the rights and settings of the user. Kiosk systems are a good example of this; an Administrator would typically have an unrestricted desktop experience. If that user logs onto a Kiosk machine, he or she would normally have a "wide open" desktop. This might be dangerous, so it may be useful to enable Replace mode to enforce a specific set of enforced settings. As Facebook Chat, Google Talk, Lotus Same-time and Jabber etc have come under the same platform of the real-time communication protocol XMPP, seemingly other chat clients tend to focus on changing their plat form to XMPP. Google talk and Jabber have already proven and got recognized for its less vulnerability behavior comparing to Yahoo messenger and Windows messengers, so the main strength of XMMP is its security. The Extensible Messaging and Presence Protocol (XMPP) is an open technology for real-time communication, which powers a wide range of applications including instant messaging, presence, multi-party chat, voice and video calls, collaboration, lightweight middleware, content syndication, and generalized routing of XML data. It is build based on Extensible Mark-up Language (XML). Unlike most instant messaging protocols, XMPP uses an open systems approach of development and application, by which anyone may implement an XMPP service and interoperate with other organizations' implementations. The software implementation and many client applications are distributed as free and open source software. The core technology behind XMPP was invented by Jeremie Miller in 1998, refined in the Jabber open-source community in 1999 and 2000, and formalized by the IETF in 2002 and 2003, resulting in publication of the XMPP RFCs in 2004. The first IM service based on XMPP was Jabber.org, which has operated continuously since 1999 and has offered free accounts to users of XMPP. From 1999 until February 2006 the service used jabberd as its server software, at which time it migrated to ejabberd. In January 2010, the service plans to migrate to proprietary M-Link software produced by Isode Ltd. In August 2005, Google introduced Google Talk, a combination VoIP and IM system which uses XMPP for its instant messaging function and as a base for its voice and file transfer signalling protocol. The social-networking giant Facebook opened up its chat feature to third-party applications via XMPP. The Facebook developers' site notes that Facebook Chat does not actually run an XMPP server internally, but merely presents an XMPP interface to clients; consequently, some server-side features like roster editing cannot be done via XMPP. In addition to Google Talk, many other public IM services use XMPP, including Live Journal's "LJ Talk" and Nokia's Ovi. Furthermore, several enterprise IM software products that do not natively use XMPP nevertheless include gateways to XMPP, including IBM Lotus Sametime and Microsoft Office Communications Server. Although the core technology is stable, the XMPP community continues to define various XMPP extensions through an open standards process run by the XMPP Standards Foundation. There is also an active community of open-source and commercial developers, who produce a wide variety of XMPP-based software. Is there an effective way to merge two Facebook accounts? Currently Facebook does not provide account merging feature for its users. Facebook does not allow you to merge your duplicate account to your much active account. Copy your profile content (e.g. photos, notes, etc.) and add it manually to your more active account. Unfortunately, there will be some things you cannot transfer, such as Friends and Wall posts. Once you have moved all information onto a single account, please deactivate your old account from the Settings tab of the Account page. Afterward, you can add email addresses and networks to your new account from the Account page. You can use 'Suggest Friend' option and bring your friends who are in your unwanted account to your active account. How to login to multiple google / gmail account in firefox? Can I login to multiple gmail / google account in the same web browser? This is the question many of us would have in mind, because most of us use multiple google account for different purpose. Now google is giving you opportunity to use your multiple google account in same browser, thanks google, now firefox lovers need not to go back to internet explorer to login to your secondary email! as you see in the below picture, you will get one option to switch the multiple login option on or off. If it is in off mode, please turn it on. There will be a message telling you that this is an advanced feature that works for Gmail, Google Calendar, Google Sites, Google Reader, Google Voice, App Engine and Google Code. A new drop-down will appear next to your email address in Gmail, and other relevant Google products. This drop-down allows you to click on it, and sign into any new Google account from the drop-down menu without having to close out of your currently open Google account. If you check the URL for each account, you will see that Google now numbers each one differently to identify them distinctly. Note that your default account becomes the first account that you sign in to. This means that when you sign into non-Google products unable to support Multiple Accounts, that your sign-in will be done via your default account. You will need to check all these terms and then click Save changes button at the bottom left corner of the page as shown in the image below. Once you have enabled this you can sign in to your another secondary google account using this feature in the same browser and switch between them using the drop down at top right corner as shown in the image below. After completing this process, you will see your secondary account in a drop down box, as seen in the picture below. Remember, If you don’t see this feature in your google account settings, just wait for some days as it will be rolled out soon across all the google account then you will see and use it. Outlook .OST files and its usage. When Outlook is used in conjunction with Microsoft Exchange Server, you can set it to work with the Exchange mailbox offline. At that time, Outlook will make an exact copy of your mailbox on the Exchange Server, called offline folders, and store it in a local file, which is called offline folder file and has a .ost file extension. OST is the abbreviation for "Offline Storage Table". When working offline, you can do everything with the offline folders just as if it were the mailbox on the server. For example, you can send emails which are actually put in the offline Outbox, you can also receive new messages from the other online mailboxes, and you can make changes to the emails and other items as you want. However, all these changes will not be reflected to your mailbox on the Exchange server until you connect to the network again and synchronize the offline folders with the server. During the synchronization process, Outlook will connect to the Exchange server via network, copy all the changes made so that the offline folders will be identical to the mailbox again. You can select to synchronize only a specific folder, a group of folders, or all the folders. A log file will be used to record all the important information about the synchronization, for your reference later. Since Outlook 2003, Microsoft introduces a Cached Exchange Mode, which is actually an improved version of original offline folders. It is featured in more efficient synchronization mechanisms and more convenient offline operations. Make it possible for you to work with your Exchange mailbox even there are no network connections available. When disaster happens on the Exchange server, such as server crashes, server database corruption, etc., the offline folder file on the local computer still contain a copy of your Exchange mailbox, with some offline updates. At that time, you can utilize Advanced Exchange Recovery to recover most of the contents in your Exchange mailbox by scanning and processing the data in local offline folder file. The offline folder (.ost) file, like Outlook personal folders (.pst) file, is normally located in a predefined folder. You may also search for file "*.ost" in your local computer to find the location of the file. The OST file is the local copy of your Exchange mailbox, which contains all your most important personal communication data and information, including emails, folders, posts, appointments, meeting requests, contacts, distribution lists, tasks, task requests, journals, notes, etc. When you have various problems with your mailbox or offline folders, for example, the Exchange server crashes or you cannot synchronize the offline updates with the server, we highly recommend you to use Advanced Exchange Recovery to recover all data in it. One of the most popular web browsers, Opera, released its new stable version for Mac OS. 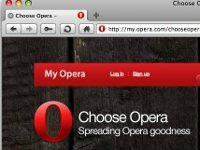 Market leaders such as Firefox and Internet Explorer will be facing real competition from Opera now. But Apple’s own product, Safari, is the most used browser on Mac platform. The new Opera 10.52 is claimed to be 10 times faster than the Opera 10.10 version. So Firefox and Chrome for Mac already have a tough competition in terms of speed. Opera 10.52 features native Cocoa integration, multi-touch trackpad gestures support, and Growl notification support. The design of Opera for Mac has been overhauled and the browser also supports multi-touch gestures on the glass trackpad of MacBook Pros. Opera has also added Growl notification support and so you'll get certain notifications if your download is complete or pop-up is blocked, etc. Opera also brings Turbo compression technology in this browser which allows surfing even in slower or congested networks. 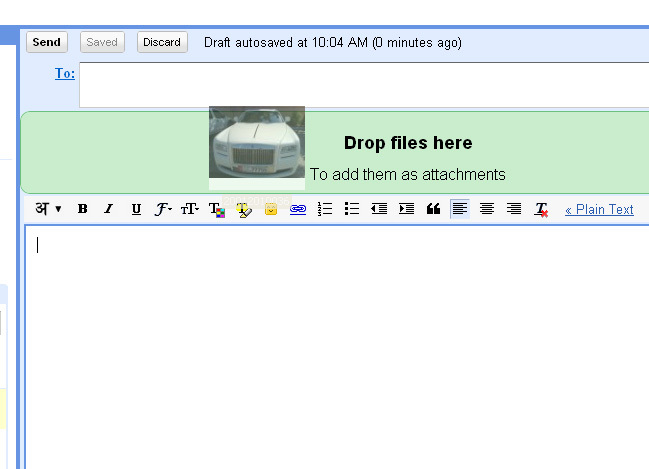 Another exciting feature for Gmail, drag-and-drop your attachments! Another exciting feature from Google, and now it is for Gmail, the most popular email service over the internet. 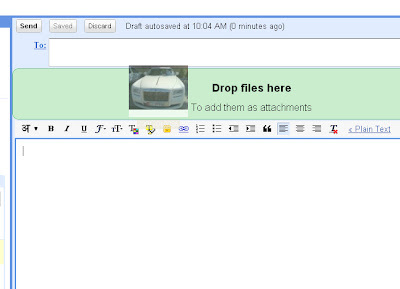 New Gmail feature, which it claims will offer a quick and easy way to add attachments and related media to messages. Chrome and Firefox 3.6 users can now drag-and-drop files into the email body when attaching them. This replaces the usual method of clicking the 'attach a file' option, and will be helpful for users who already have the associated folder open and a number of files to attach. "Suppose I want to attach some files to an email, and I already have a folder open containing those files. I used to have to click 'Attach a file', find the photos, click them, etc. [Now] I can just drag and drop the files to attach them," said Google software engineer Adam de Boor in a blog post. Just login to your gmail account from Firefox or Chrome, and select compose email. Now, select any photo or document from your hard drive, drag and drop it into Gmail’s compose window. But, for sure, it won’t work with any version of Internet Explorer! It seems Google intentionally excluded IE from this feature, in order to drive IE users to their own product , Chrome. Facebook: How to see old wall posts quickly, rather than pressing ‘Older Posts’ several times? Update: Facebook Timeline is here! You can scroll down through the timeline and find out your posts and photos that you have added months and years back. Click here to learn how to enable timeline. So is there any short cut to see my older posts? Unfortunately, Facebook doesn't provide any official tools to find out the older posts, and there is no any better shortcut to see your older posts very quickly. I googled it many times, but didn’t get a proper solution. But Facebook is keep on changing every day, and hopefully they will soon add a feature for the quick view of the old posts, just like searching the posts by date. Try the below tip other than pressing ‘Older Posts’, which may help you eliminate scrolling though some unwanted contents. Click on your profile and open up your wall (as if your friends see your wall), click on ‘Options’ on top right. Now you will get an option that looks like as in the blow picture. Select only your name, now paste the below Java script on the address bar and hit enter, this script will press the 'Older Posts' button every four seconds, so keep the browser window free. Scroll down and check after few minutes, you can see all the older posts displayed. If you see your old post which you are looking for is already visible, just press on the blue area of 'Older Posts' tab, so you can stop the script. Hope this helped you. But if you know any better idea to fetch out older posts so quickly, please posts it below in the comments. Laptop is past, Rolltop is the future sensation! The changing concepts of Computers are boosting more and more innovations. Here is the blue print of the replacement of Laptops! This is called Rolltop, it can replace not only laptop, but, tablet PC and even a Television. See this video, and experience the changin concepts of future computing! This concept is based on OLED-Display technology and a multi touch screen, it can be used a laptop while it weighs as much as mini notebook. It comes with a 13 inch screen while being used a laptop and when being used as a monitor, you could get a cool 17 inches screen. Power supply, multi media integrated pen and even a holding belt are integrated in the ROLL TOP and it certainly is an all-in-one gadget. We can assume that this product will be manufactured and marketed, soon and if so, you could carry your laptop like a newspaper by rolling it up, and making sure that you are not burdened by heavy laptop bags. While this is still a concept, we can hope to see it in real, as every concept is materialized by the innovators! How to add favicon (favorite icon) into your Blogger blog. A step by step tutorial. A favicon, the short form of favorite Icon, is a small icon which is displayed on the browser tabs just left side of your website or blog title. Favicon has been very important element for websites or blogs, as it can act as symbol of your websites, as such, by seeing ‘f’ in white color with blue background, we will immediately come to know it is facebook. Here let us talk about adding favicon to your blogger or Wordpress blog. First of all, you have to design your favorite icon, following the trend, it is better to make the first letter of your blog name as foreground and your favorite color as background. Click on ‘brows’ there, and select your picture that you already created. And now select ‘generate favicon icon’. Now you will get an output of .ico files, download the file to your desk top. Now, copy the bare file location of the .ico file, from the online storage. Note: Copy the location and paste it into another browser, and check if it is displaying correctly! If you still didn’t understand how to copy the file location; right click on the image in browser, and select ‘copy link location’ (in firefox) and now paste it in a notepad file. Now you got the file location URL. Also make sure that you have uploaded the .ico file in the ‘public folder’ in Skydrive or flickr, otherwise it will not display in public! Replace http://faviconurl to the URL that you have already copied in the notepad. Now, go to blogger settings page, and go to ‘Layout’, then ‘Edit HTML’, expand to ‘widget template’. 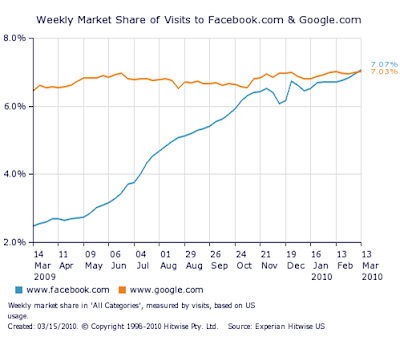 Good news for Facebook lovers; Now it is most visited webiste in US beating Google.com. Facebook crosses another milestone! Now it is the most visited website in the US, beating the long time number one, google.com! The social networking giant overtook Google's search engine page this week to become the most visited website in the U.S. According to research from web statistics firm Hitwise, Facebook edged google out by .4 percent, after almost tripling in unique visitors from the past year. Even though this is a very small margin, it is a great achievement for facebook, as it is rapidly grasping popularity in other countries. By comparison, visits to search engine home Google.com increased only nine per cent in the same time - although the tracker does not include Google property sites such as the popular Gmail email service, YouTube and Google Maps. Taken together, Facebook.com and Google.com amounted to 14 per cent of the entire US internet visits last week, Dougherty said. Facebook, which first launched to the public in 2004, has become the de facto standard for social networking and has added music and games and enhanced content features. Google is also running social networking services similar to Facebook called ‘Orkut’, but it could not get much popularity except countries like Brazil and India. Recently, Google has taken steps to counter Facebook by offering a social networking feature for their Gmail service called Buzz that lets users share media such as videos and photos. Google has indicated that they are considering making the Buzz feature a stand-alone service. 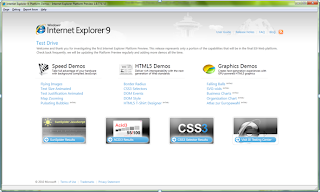 Microsoft has released the beta for the newest version 9.0 of their most popular Internet Explorer browser. The beta has bunches of new features, however does not have the updated version 9 UI. Microsoft pointed out that IE9 will not run on Windows XP at all, and even in Windows Vista, Service Pack 2 must be installed to load IE9. This is just the first of many IE9 preview builds that will precede the first beta release. 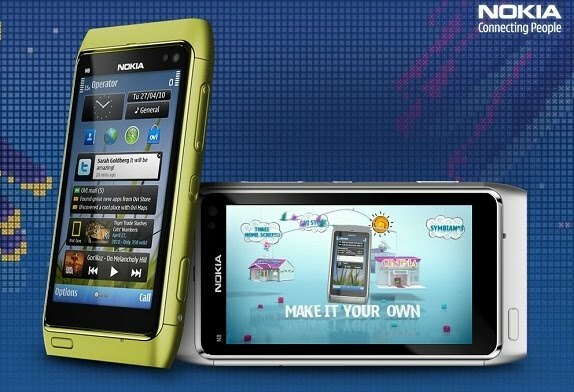 Microsoft not yet announced the date of final release, but we can guess that it will be release during late 2011. Windows Server 2008; Upgrading Current IIS versions to IIS7. · Source operating system must be Windows Server 2003 Service Pack 1 or greater. NOTE: Upgrading from any version of Windows 2000, running IIS 5.0, to Windows Vista or Windows Server 2008 running IIS 7.0 is not supported. The upgrade process takes place over three stages: detect & gather, installation, and applying of settings. These steps only apply to operating system features and settings; any file system content not created or owned by the operating system will remain intact through the upgrade process. What this means is that all web content present on the original operating system will be present after the upgrade. The installation phase consists of installing the Windows Vista or Windows Server 2008 operating system, and then installing any optional features (such as IIS) if they were detected on the original operating system. The choice of which IIS 7.0 updates to install is based on the IIS state information gathered from the original operating system. After the operating system installation and optional feature installations have completed, the state information gathered from the original operating system is applied. 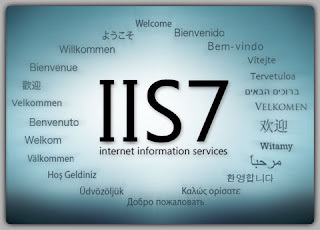 This is when the IIS metabase settings from the original IIS installation are translated and updated into the new IIS 7.0 config store, ApplicationHost.config. Oclist.exe lists all the packages to use with ocsetup.exe to add/remove a role or feature. This also tells you if something is not installed on the server. Windows optional components are parts of the Windows operating system that can be individually added, removed, enabled, or disabled. You can use the Ocsetup.exe tool at the command prompt to install or to remove Windows Vista optional components. You must have administrative credentials to run the Ocsetup.exe tool.